DC is finally stepping out of Marvel’s shadow and showing off their cool super-hero characters for all the fans to see. The Warner Brothers’ new movie, Shazam, just released last Friday and the audience response was beyond impressive with a 93% on Rotten Tomatoes. Having made my way to the theaters to see the movie for myself, I will reveal some of the movie’s highlights and odd moments. if you haven’t seen Shazam and don’t want to read any spoilers, I suggest you not read this article. The movie introduces you to the future superhero, Billy, pretty quickly by showing off his cunning and witty personality through unique events. Later on, in the story Billy meets the last standing guardian of Shazam’s powers, and may I say the scene was very funny. One thing the movie has going for it is the comedic moment that pop up in perfect timing. If you are looking for a pure laugh while watching a fourteen-year-old boy learn the meaning of being a superhero and save his family, this is definitely the movie to watch. Continuing on with the plot, after Billy gains powers that he has no idea how to control he must ask his new friend and hero expert, Freddy. Freddy is a hard-not-to-love character that knows just how to transform Billy from zero to hero and how keep you smiling. One odd concept of the movie was the villain and the fact that he was able to hold such a large grudge since he was a kid to his adult years. When the villain discovers there is in fact such things as super heroes and magic he was a small kid, and something that I would have dismissed as a crazy dream he made his life work (talk about dedicated). On the other hand, the villain was played well through the actor choice, Mark Strong, who not only was able to look the part but stay really dedicated to his evil pursuits. Another smart casting choice was Zachary Levi, the actor that played Captain Marvel in Shazam. He was able to take the comic book character and bring him straight to life, the mannerism he used to stay true to his part (a kid who only looks like a man) were spot on and always laughable. The character, Captain Marvel, looked as if he jumped right out of the comic book pages I was thoroughly impressed on how they were able to capture the look of the superhero so well. In all I would confidently say that DC is getting its groove back with working its way back into fans’ hearts after a few times where they did not exactly hit the hammer on the nail. 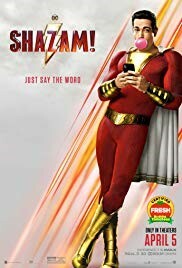 If you are on the fence about whether or not to go see Shazam, I recommend it strongly.